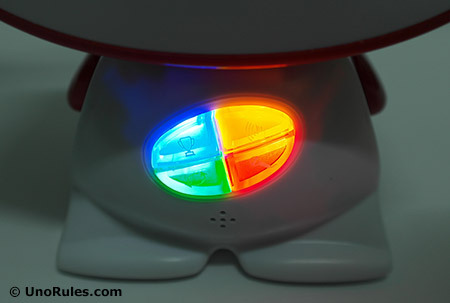 Uno Roboto is a charming version of Uno with a small little “robot" that can record speech and talk. This robot becomes the new referee of the game and he brings loads of fun. Although the robot seemingly has its own artificial intelligence, this is down to its programmed ability to record and playback speech. Yes, it can talk out right out of the blue! In terms of number of cards, Uno Roboto has the same number as Classic Uno (108 cards), with only the addition of 4 extra “House Rule" cards for reference purposes. Most of your attention will be focused on the little robot guy, so let’s get familiar with him first. 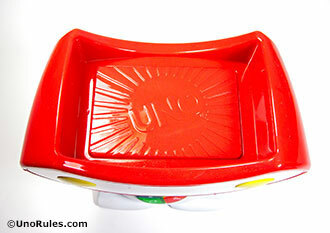 The first thing you notice on the robot is the Discard Tray and Discard Plate located on top of its head. This is where you hold the Discard Pile during the game. Meanwhile, the Discard Plate is the part of the robot that needs to be pressed most of the time during gameplay. The robot runs on 3 AA alkaline batteries, which thankfully, are supplied by Mattel. On the robot’s back there is the power switch, which can be set to on, off, or trial (Try Me) mode. The Try Me mode merely records a single player’s name and cannot be used to play a game. It’s meant to familiarize the players with name recording by practicing to speak into the microphone (prior to starting a game). Red Record Button – Press this button to record stuff, such as your custom rules, and the names of each player. Yellow Volume Button – This button cycles through all the volume settings, from soft to loud. Green Repeat Button – Press this button to get the robot to repeat what he just said. Blue Win Button – This button is pressed when a winner is confirmed. It clears the robot’s memory to start a new game. The robot will go to sleep after one minute of no activity. To keep the robot awake or power him back up, simply press the Discard Plate. 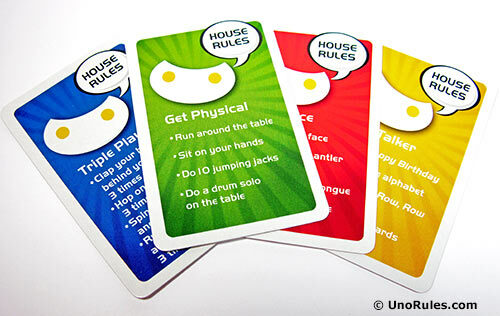 The House Rule cards are 4 cards that have a bunch of “House Rules" printed on both sides, which must be carried out as quickly as possible by ALL players. House Rules are special custom rules for Uno Roboto that you can create yourself by speaking into the microphone, OR by referring from any of the 4 ready-made Uno Roboto House Rule cards. Each game can only use ONE House Rule. The robot will call out the House Rule from time to time (randomly) and when it does, all players must race to complete it. The last finisher of the House Rule must draw two cards from the Draw Pile. The robot can also issue Surprise Commands randomly, to any player during gameplay, so be ready for that! Surprise Commands are random commands apart from House Rules, which the robot will announce from time to time to any of the players. There is no running away from the orders issued by the robot; he may even ask two players to duel with each other to complete a task, and the loser will need to draw two cards! After each Surprise Command, the robot, will then call out the name of the player that will go next, thereby changing the flow of the game. If a Surprise Command results in any player having to put down a card on the Discard Pile, that new card then overrules any existing cards on the Discard Pile below it, and affects whoever that has to resume play. 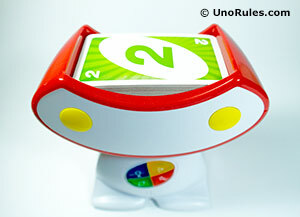 For example: Three players play Uno Roboto – Jim, Jeff, and Jane. For his turn, Jeff plays a Red Draw Two card onto the Discard Pile. He presses the Discard Plate. Of course, the next player needs to draw two cards and miss their turn. However, the robot suddenly calls out to Jim to discard all his green cards, and then asks Jane to continue after him. Jim has a Green Skip card, and so he places it on top of the Discard Pile. His card overrules Jeff’s Red Draw Two card played earlier. Since the next player to go (as per the robot) is Jane, she needs to skip her turn (let’s assume the players are seated in a circle and play follows a clockwise direction). The next player to play again, is now Jeff. Going back to Jim (earlier), IF he didn’t have any Green cards to play, he doesn’t have to do anything (skips his turn), and play proceeds with Jane. Since the Red Draw Two card played by Jeff is still on top of the Discard Pile, Jane therefore needs to draw two cards now. Gameplay is very similar to Classic Uno and all the Action/Symbol cards are the same. The only difference is the addition of the robot (who sort of acts like a “referee") and the House Rules, adding a twist to the game. First of all, take out the 4 House Rule cards; they are just for reference. Choose a dealer, who will then deal out 7 cards to each player (2-6 players may take part in any single game). The remaining deck is placed faced down next to the robot to form the Draw Pile. Turn over the top card from the Draw Pile and as long as it is not an Action card, place it on the Discard Tray (on the robot’s head). This is your Discard Pile. Now flip the robot’s switch to ON, and it will power up. It will ask each player to give their names. Go ahead and press the Red Button, hold it down, and speak your name into the microphone. Each player does this and once all have given their names, press the Discard Plate. At this point, the robot will call one of the players to record the House Rule for the game. As mentioned earlier, you can refer to one of the given House Rules in the House Rule cards provided, or you can create something of your own. When you place a card in the Discard Pile, press the Discard Plate as well. However, do not press the Discard Plate if you are discarding cards just in case the robot suddenly issues a Surprise Command. Once your turn is over, play continues with the next player in a clockwise direction (as per normal Uno rules). If the Draw Pile becomes depleted at any time, and no one has discarded all their cards yet, shuffle the Discard pile and turn it upside down to form a new Draw Pile. 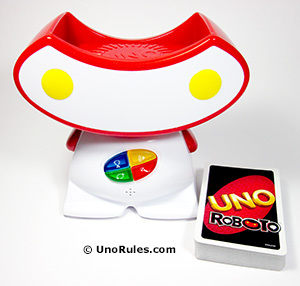 To win Uno Roboto is simple – You just need to get rid of all your cards. There is no need to score 500 points (or any points) at all. Don’t forget to yell “Uno" when you are down to your last card. A reminder: If you are lucky enough to be asked to discard all your cards by the robot, do not press the Discard Plate at all, and don’t forget to yell Uno when you are down to your last card. When you finally get rid of all your cards, press the Blue button on the robot’s belly to win the game! The robot will now congratulate you. To play again after pressing the Blue button, simply press the Discard Plate. The robot will remember all the player’s names, unless you turn the back switch OFF and then ON again. This clears the robot’s memory.